Recently I had the opportunity to travel for work to Philadelphia and New York City. Neither city really sticks out as a major brewing hub in my mind but, as always, I thought I’d do my best to find some of the best watering holes in the city. I arrived in Philadelphia on a Tuesday afternoon and had some time to head out and check out the city. After walking from my hotel and checking out the Liberty Bell and Independence Hall, I stumbled across a particularly nice part of town called Olde City. 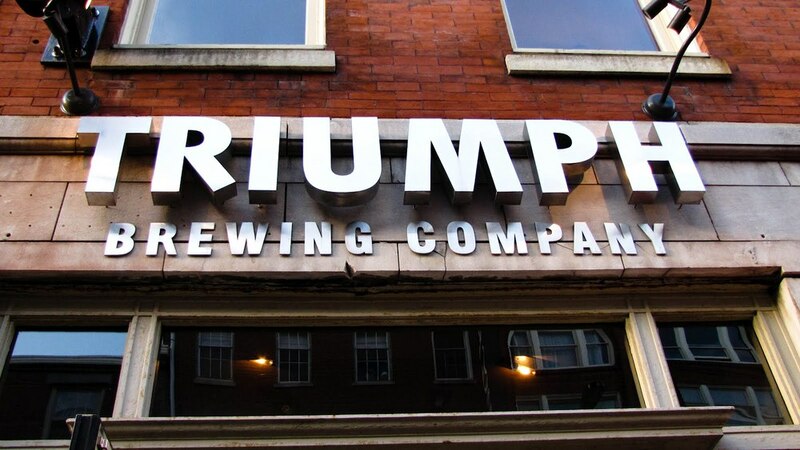 Prior research had told me that I’d find a few good beer bars around here so I decided to check out Triumph Brewing Company. The first thing you notice when walking in here is the beautiful bar itself. The brewing equipment is housed above the bar and is visible to all in the relatively small space. The brick walls are covered in various beer related equipment and the furniture at the bar and surrounding tables looks cozy and comfortable. They even have a small stage in the corner where they have live music several times a week. Pulling up a bar stool, I checked out their beer menu (above). The bartenders were generally friendly and offered me several samples before making a final decision. As usual I went first to the Bengal Gold I.P.A, which, for an IPA was relatively light but very refreshing. Later I tried the Amber Ale, which while tasty and pretty bitter for an Amber was a little sweet for my tastes. Overall, the beer at Triumph was delicious and, combined with the awesome surroundings made for a place that I’ll absolutely be visiting again when I get the chance. Literally just around the corner from Triumph in Olde City, you’ll find a completely different though no less awesome bar called Khyber Pass Pub. These guys specialize in a wide variety of draft and cask beers from local areas and around the world. The pub itself is very small and the bartender told me it was the second oldest still running pub in the US, opening in 1867. I’ve been unable to actually confirm this but there was obviously a lot of history in this place. Again, the bartenders were more than friendly, especially when they realized I was interested in finding out more about their beer. Reaching back to my roots, I first tried the Sly Fox Chester County Bitter brewed in Pottstown, PA. Thankfully, the guys at Khyber actually know how to serve a Bitter and didn’t super cool it. This resulted in me getting exactly what I expected and one of the few Bitters I’ve had in the US that I really enjoyed. I plan on keeping an eye out for other Sly Fox beers on my travels as it one you don’t see much of in the Midwest. For the second round, I tried out Cigar City’s Jai Alai IPA, mainly due to it’s interesting description on the menu (see image above). I have to say, this was one of the more unique IPA’s I’ve tried. If you’ve ever tried a beer such as Half Acre’s Daisy Cutter, you know that while hoppy, it has a extremely distinctive fruit note. This was in the same vain as that and I definitely enjoyed trying it out. Again, this is one of the breweries that I have had little to no exposure to and would definitely like to see more of in future. One final comment goes to the quality of Khyber Pass’ food. I had the opportunity to meet a couple long lost friends for dinner and, as I find more and more frequently in these kind of beer bars, the food was excellent. Do not hesitate to try it out next time your in need of a place to eat in Philadelphia! On a completely unrelated note, here’s a picture of the delicious Cheesesteak I got at Pat’s King of Steaks before heading out of town. I felt like this was a pretty good way to wrap up my Philadelphia experience.